FRENCH INDO CHINA P57s 1939 ND 500 PIASTRES PCGS 68PPQ THIS PIECE IS ABSOLUTELY AMAZING! TO FIND THIS NOTE IN THIS CONDITION WHILE IT'S PRINTED ON THE "RICE PAPER" WHICH IS SO THIN YOU COULD BLOW A HOLE THROUGH IT IS ALMOST MIRACULOUS! THIS PROBABLY EXPLAIN WHY THERE'S NEVER BEEN ONE GRADED! THIS PIECE JUST CAME IN FROM OVERSEAS, AFTER WAITING ALMOST A MONTH..... IT WAS WELL WORTH THE WAIT! FRENCH INDO CHINA P57 500 PIASTRES CGC 58PQ "ONLY PIECE EVER GRADED BY ALL GRADING CO'S!" THIS PIECE IS ABSOLUTELY AMAZING - BRIGHT COLORS, EXCELLENT CENTERING, SHARP CORNERS. F.I.C. PAPER IS PRINTED ON "RICE PAPER" AND IS ULTRA THIN, JUST AMAZING IT HAS SURVIVED SO MANY DECADES IN SUCH HIGH CONDITION! THIS IS A VERY VERY POPULAR NOTE TYPE (DESIGN) AND IS HIGHLY SOUGHT AFTER. TO FIND THIS PIECE IN "ISSUED" FORM IS VERY RARE INDEED! PROBABLY ONCE IN A COLLECTOR'S LIFETIME! FRENCH INDO CHINA P75s "RICE FIELD FARMERS" 1951ND 5 PIASTRES "SPECIMEN" GRADED CGC 66PQ SUPERB GEM!! FINEST KNOWN CGC & TIED WITH ONE OTHER 66 – BY ALL GRADING CO's! "RICE FIELD FARMERS." A VERY SOUGHT AFTER NOTE TYPE BY ALL COLLECTORS! INCREDIBLE MARGINS, COLORS AND SHARP CORNERS! FRENCH INDO CHINA P75a 5 PIASTRES 1951ND CGC 35NET (THIS IS AN UNC. NOTE WITH PROFESSIONAL RESTORATION "ONLY 2 EVER GRADED BY ALL GRADING CO'S!" "FARMERS WORKING IN RICE FIELDS" DESTINED FOR A WORLD CLASS COLLECTION THAT HOLDS RARE AND UNIQUE TREASURES! 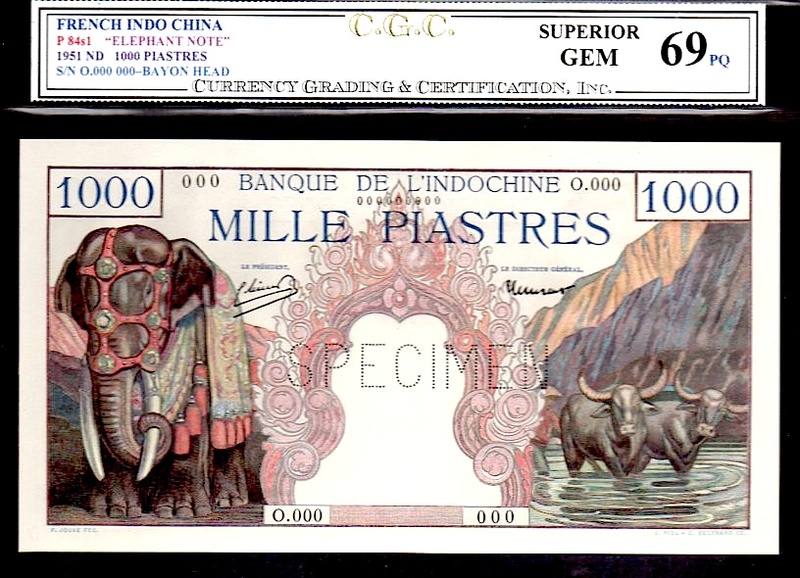 FRENCH INDO CHINA P75r "RICE FARMER" 1951ND 5 PIASTRES GRADED PMG 65EPQ GEM UNCIRCULATED!! ONLY 10 GRADED BY ALL GRADING COMPANIES, TIED FOR 2nd FINEST GRADED TO DATE! FRENCH INDO CHINA P82b DATED 1954 CGC 68! "FINEST KNOWN & ONLY PIECE EVER GRADED CGC & ALL GRADING CO'S! "MERCURY- ELEPHANTS!" THIS PIECE HAS VERY NICE CENTERING, SHARP CORNERS AND BEAUTIFUL COLORS!!! THIS IS SUCH A POPULAR AND COLLECTIBLE PIECE BUT EXCEEDINGLY DIFFICULT TO EVER FIND A TRUE UNC, LET ALONE AN "ULTRA GEM 67PQ!" FRENCH INDO CHINA P84s1 "SPECIMEN" 1951ND 1000 PIASTRES CGC 69PQ FINEST GRADED by ALL GRADING CO'S! A VERY SOUGHT AFTER ISSUE! DESTINED FOR A WORLD CLASS COLLECTION THAT HOLDS RARE AND UNIQUE TREASURES! THERE IS ACTUALLY ONE OTHER PIECE IN A 69EPQ HOLDER (GRADED BY OTHER CO.), SO TECHNICALLY THIS PIECE IS TIED FOR FINEST KNOWN! THAT OTHER PIECE WAS OFFERED ON EBAY A SHORT WHILE AGO, I BELIEVE, FOR $18K OR $20K! 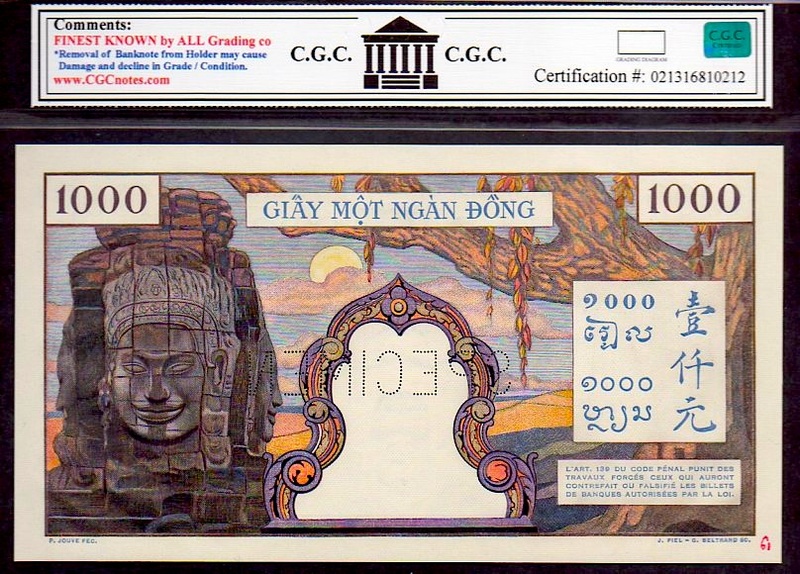 FRONT VIGNETTE DISPLAYS THE MIGHTY ELEPHANT AND THE REVERSE FEATURES THE "BAYON HEAD." THIS TYPE "ONLY" COMES IN SPECIMEN FORM, NONE WERE ISSUED. AS CLOSE TO A PERFECT GEM (70) AS ANY COLLECTOR COULD EVER HOPE FOR! A ONCE IN A COLLECTORS LIFETIME OPPORTUNITY! FRENCH INDO CHINA P97 DATED 1954 CGC 67! "FINEST KNOWN & ONLY PIECE EVER GRADED CGC & ALL GRADING CO'S! "TEMPLE of ANGKOR!" THE THREE LADIES AT LEFT REPRESENT CAMBODIA, LAOS AND VIETNAM. WATERMARK IF OF THE ELFEPHANT. THIS PIECE HAS VERY NICE CENTERING, SHARP CORNERS AND BEAUTIFUL COLORS!!! THIS IS SUCH A POPULAR AND COLLECTIBLE PIECE BUT EXCEEDINGLY DIFFICULT TO EVER FIND A TRUE UNC, LET ALONE AN "ULTRA GEM 67PQ!"